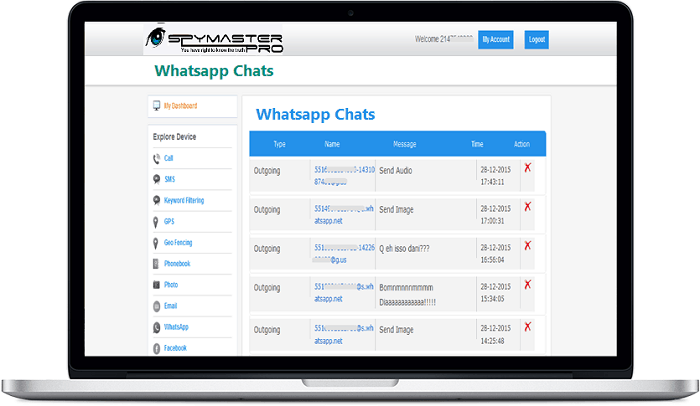 Spymaster Pro is a world-wide popular Whatsapp Spy Android software that is used by lots of people to track others whatsapp chats either on the basis of a doubt or just to protect them from danger. Spymaster Pro is one of the most reasonable priced and easy-to-use Whatsapp spy app for Android devices. Once installed (will hardly take two to five minutes), this software will start copying the data from the target device, and send all reports directly to the user’s spymaster pro account . See the names or numbers of all people the target user chats with. Get the date and time of each message sent or received. Spymaster Pro has become customers‘ No. 1 preference bnecause, everything about this app is easy, including competitive price tag, exclusive features, user interface, and software installation. What’s more, unparalleled customer support, ensure that all your doubts and issues are solved and resolved in no time.